Panorama Center - What is Panorama Center? 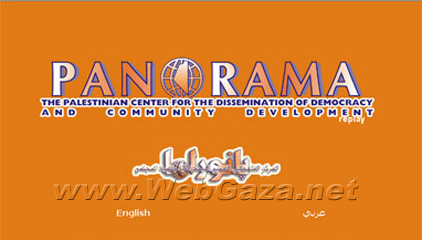 Panorama- the Palestinian Center for the Dissemination of Democracy & Community Development was established in 1991 in Jerusalem. The center works to contribute to community development, and to promote issues that are related to the relationship between the citizen and the society, as a means to build a pluralistic Palestinian civil society. Panorama is a non- governmental, non- profit organization that runs its programs through three offices in Ramallah, Jerusalem , and Gaza . Our programs and activities aim to raise the awareness of the Palestinian people on democratic concepts, and notions of the civil society. Panorama is actively working to promote and disseminate issues related to democracy, human rights, participation in public life and the different decision- making processes that are based on the concept of freedom of expression.